The Far East’s answer to the Hamptons, the royal resort town of Hua Hin is a delightful mix of cosmopolitan city and seaside retreat. The eight-kilometer-long Hua Hin beach is dotted with pine trees and Bangkok’s high society. New eateries, cafes, boutiques, and art galleries have popped up to cater to this stylish crowd, such as the trendier-than-thou Seenspace—Thailand’s first beachfront community mall. 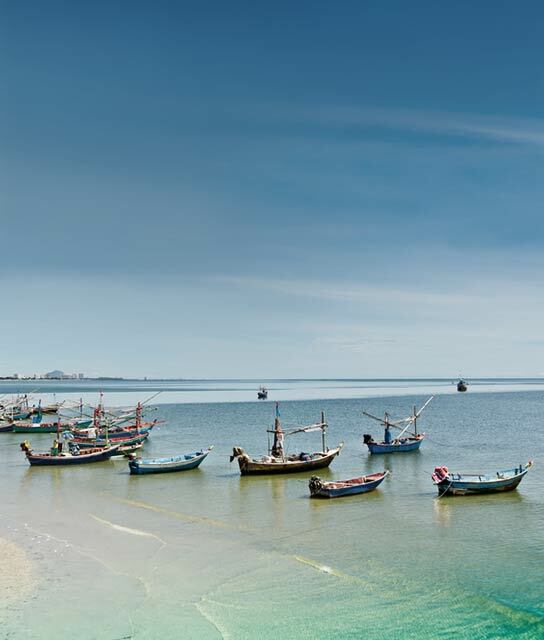 Just a few hours outside of Bangkok, the low-rise town is sprawling with food markets and clean-lined modern boutique Hua Hin hotels. Fishing boats still bob lazily against a cerulean sky and hawkers peddle everything from herbal remedies to freshly made ice cream and barbecued pork skewers. The royal resort town was made famous by King Rama VI and Rama VII who built their summer palaces here in the 1920s, most notably the Phra Ratchawang Klai Kangwon (Far from Worries Palace), which is now also the town motto. Hua Hin’s easy accessibility from Bangkok makes this utterly beguiling corner of Thailand worth exploring. Like an abstract expressionist composition, Hotel Bocage balances the seemingly opposing forces of geometric construction and the expansive, open sea.